The project works on the concept of DTMF (dual tone multi frequency) tone command so received from any phone to remotely switch any electrical load such as agricultural pump, domestic and industrial loads etc. In industries, the loads are spread over a large area and thus, operating these loads is a very tiresome and difficult task. In agricultural fields also, pumps and other loads are connected over a large area and hence it is difficult for the farmer to operate all the loads and similarly for house hold loads. Keeping these problems in mind, the proposed system has been designed which uses DTMF technology to control the loads remotely. A cell phone is interfaced to a DTMF decoder in the system from its audio output socket for receiving tone commands. The receiving cell phone codes are converted into digital commands by using a DTMF Decoder which will identify the frequency of the key and convert that frequency to its equivalent digital code which is then fed to a microcontroller (8051 family). 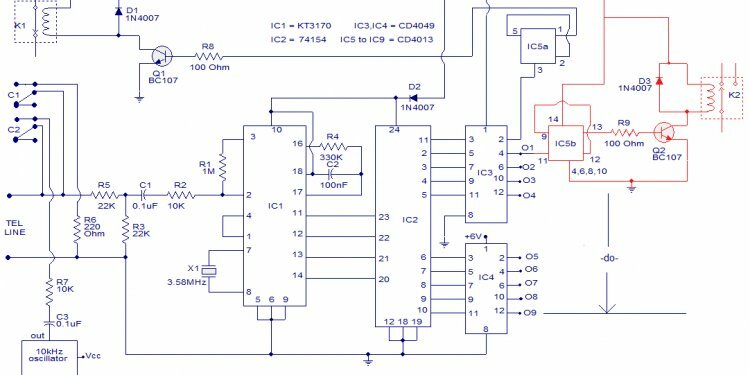 As per the commands sent from the sender’s mobile, the microcontroller will send signals through a buffer to actuate the respective loads by turning the relays ON/OFF. These relays are actuated by a relay driver IC interfaced to the microcontroller.